The blind man throws away a cheque for one hundred rupees and clings on to a valueless piece of glazed paper, considering the latter more desirable because it is smoother to his touch. He lacks a proper sense of values because he is blind. Like him, the two-year old child also prefers a cheap toy to the cheque. He too is ignorant of real values, because he is immature. However, multitudes of intelligent men and women throughout the world are doing exactly the same thing today. And they are doing it without even realizing it! Do you have a proper sense of values? A mistaken idea of true values can lead any one of us to a wasted life; and the greatest tragedy in the world today is wasted human lives. Nor is this wastage peculiar to the irreligious, one finds it among the religious as well. Man is born spiritually blind. He is unable therefore to assess the relative values of the things of time when compared with the things of eternity. As a result, he spends his time and energies in seeking the wealth, the honour and the pleasures that this world can give him. Little does he realize that ” the things that are seen are (all of them) temporal,” whereas ” the things that are not seen (and they alone) are eternal ” (2 Cor. 4:18). Jesus challenged the wrong sense of values held by even religious people of His day when He told them that a man would profit nothing who gained the whole world if in doing so he lost his soul. If a man is not rightly related to God through Jesus Christ then he will discover, in the day that he stands before his Creator, that all he has achieved and acquired on earth is utterly valueless. There are multitudes of believers, too, whose “sins are all forgiven” and who are “on their way to heaven,” yet whose values are no less confused. In the day of judgment they will find to their surprise that, though their souls may have been saved, their lives have been wasted. They have sat as spectators on the side-lines, content with their salvation, happily singing choruses, watching others being used of God but unaware that He wants them on the field as well. Occasionally they may wonder why the power and joy and fruitfulness that mark the lives of other Christians are not their portion too. They may attend many Christian meetings to stimulate their spiritual life, but their inner man remains always weak and sickly. Once in a while they may have ambitions to attain a higher level of Christian living, but soon they fall back to where they started from – and sometimes even lower. What is the reason for this? Usually it is quite simple: they have not got their priorities right. Like the blind man and the child in the illustrations above, they have again and again in their ignorance thrown away the true spiritual riches and clung to what is worthless. Thus they have remained spiritual bankrupts, whereas God intended them to be rich. Jesus was forever seeking to remove this blindness from the eyes of those who came to Him. He taught them what the supreme priorities of life really are. To Martha He said, “One thing is needful.” To a rich young man He said, “One thing thou lackest.” With these words He threw into emphasis the thing that should take first place in each of their lives. Or again in Old Testament times, of David alone was it said that he was “a man after God’s own heart ” – and he certainly had his priorities right! “One thing,” he said, “have I desired.” Paul too, the greatest apostle of Christianity, succeeded in putting the right thing first. “One thing I do,” he cried; and with that as his theme he lived out the most effective life (from the standpoint of eternity) that this world has seen since Jesus of Nazareth ascended on high. The atmosphere of the world today gives to all of us without exception a perverted sense of values. Under its influence we tend to get life’s priorities wrong. For that influence is immensely powerful. Faster than ever before in the history of mankind the world is sinking into the gutter of moral decay and corruption. The darkness deepens until the night is black around us. In such conditions Jesus wanted His church to be the salt of this earth and the light of this world. But the salt has largely lost its savour and the light its brightness. Corruption and darkness have found their way into the very household of faith. And because the Pharisaic leaven of hypocrisy has penetrated so deeply into the church it is neither aware of, nor willing to face its true condition. Only those who have quickened ears can hear the Spirit of God speaking, calling even today for a reevaluation of existing priorities. In this great darkness the only light that you and I are offered is to be found in the Bible. Let us turn to it then, and seek to discover for ourselves what the prior claims upon the Christian really are. What we read there may at first hurt and even offend us, for the Bible penetrates behind our disguises. But let us take courage from the wise remarks of a twentieth century servant of God: ” The words of Jesus hurt and offend until there is nothing left to hurt or offend (cf. Matt. 11:6). If we have never been hurt by a statement of Jesus, it is questionable whether we have ever really heard Him speak. Jesus Christ has no tenderness whatever towards anything that is ultimately going to ruin a man for the service of God. If the Spirit of God brings to our mind a word of the Lord that hurts, we may be perfectly certain there is something He wants to hurt, even to death.” (Oswald Chambers in So Send I You). ” Thou sayest…I have need of nothing; but knowest not that thou art…blind; I counsel thee…to anoint thine eyes with eyesalve that thou mayest see…He that hath an ear let him hear what the Spirit saith unto the churches ” (Rev. 3:17-22). “Now it came to pass, as they went, that he entered into a certain village: and a certain woman named Martha received him into her house. And she had a sister called Mary, which also sat at Jesus’ feet, and heard his word. But Martha was cumbered about much serving, and came to him, and said, Lord, dost thou not care that my sister hath left me to serve alone? Bid her therefore that she help me. And Jesus answered and said unto her, Martha, Martha, thou art careful and troubled about many things: But one thing is needful: and Mary hath chosen that good part, which shall not be taken away from her.” (Luke 10: 38-42). How striking are Jesus’ words to Martha in verse 42: “One thing is needful!” There may be plenty of good things to be done and many indeed that may justly be considered essential. But, Jesus affirmed, one thing above all others was needful. What was that one thing? Jesus and His disciples had just arrived at Bethany. As soon as Martha saw them, she joyfully received them into her house, made them sit down and straightway hurried into the kitchen to prepare some food. Meanwhile Jesus began to preach to those present. When Martha discovered that her sister Mary had settled down to listen to His words instead of coming to her help, she rushed out of the kitchen with anger, and turning to Jesus, appealed to Him in words more or less as follows: “Lord, here I am toiling in the kitchen preparing a meal for you all, and my sister just sits here doing nothing. Tell her to get up and help me!” To her surprise, however, it was Martha herself whom Jesus rebuked. She and not Mary, He told her, was the one who was at fault. Now let us note this, that it was not for anything sinful which Martha had one that she was thus addressed. She had joyfully received Jesus into her home. The work that she then did in the kitchen was not for herself, but for Him and for His disciples. She is a picture of a believer today, who has received the Lord into her heart and who is unselfishly seeking to serve the Lord and others. Yet despite her zeal she was rebuked by Jesus. What, we ask ourselves, is the point of this? What was wrong with her action? And the answer, surely, lies in those four words of Jesus: “One thing is needful.” Martha was not rebuked for her service, but for not putting first things first. Mary, the Lord said, had chosen the good part. What was that? She simply sat at Jesus’ feet and heard His Word. Nothing more. But that is the good part. That is the one thing needful above all other things. How much place does listening have in our lives? How much time do we spend sitting at the feet of the Lord, reading His word and seeking to hear Him speak to us through it? Not very much perhaps. Other things crowd it out, so that we often find ourselves guilty of the same mistake that Martha made. It may not be mundane affairs alone that keep us pre-occupied. It may be Christian service too. We may take active part in meetings for prayer or worship or witness, and yet find that the Lord is rebuking us as He did Martha. “Mary hath chosen that good part.” This is Jesus’ own valuation of His words to her, and by inference, of all that today comes to us as God’s Word of life. Our first theme, then, is that good thing – the Word of God as given to us in the Bible. We shall look at this from three standpoints. We shall consider first the authority of the Bible, then the importance of hearing God’s Word, and finally, the effect that the Word of God can have upon our lives. We have to consider first the Divine authority of the Bible because this is the foundation to all else. To proceed further without settling this point would be as disastrous as proceeding with the construction of a building without laying its foundation. Only as we are assured of the Bible’s authority shall we value and appreciate it aright. Many who are born and brought up in Christian homes have accepted the Bible without question as the Word of God, simply because they were taught to do so by their parents or by their church, but they have never cared to establish with certainty in their own minds the reason for doing so. Thus they carry on happily for a while, until one day some modernist gives them a dose of his so-called higher criticism. “The Scriptures,” he claims, “are full of inconsistencies. The authors are not the persons named but much later writers, often writing with motives that are not above suspicion. It is impossible therefore to know what Jesus or His disciples really taught. There is insufficient factual evidence even for the great saving events. Modern man cannot possibly believe such fables.” So he goes on, and very soon their whole faith begins to crumble. Why? Because it was never properly founded in the first place. God does not ask us to believe things blindly. Many Christians give that impression to others, but it is totally wrong. God intends that the eyes of our heart be enlightened that we may know. What the Bible does teach is that our minds are blinded by Satan. As sinners, therefore, we cannot with our natural minds understand the things of God. We are thus completely dependent on Divine revelation – on God making known His message to us. (This He is ever ready to do for the sincere seeker.) Our minds are sinful, and therefore fallible. We are not perfect in knowledge. So we need not be surprised if, with our finite and fallible minds, we are unable to grasp some things in the Bible that are beyond our reason. This does not mean that the Bible is contrary to reason. It does mean however that, like little children, we are just on the threshold of Divine things. If our intellects were perfect and infallible, we would assuredly find ourselves in full agreement with the Bible. This is proved by the fact that a person who is born again, as he grows in likeness to Christ, finds himself growing correspondingly in his understanding of the Bible and agreement with it. But if instead of acknowledging our limitations we give rein to our critical faculties, we shall stumble. If we found our faith only upon what appears reasonable to our fallible intellects, one day we shall find that we have built on sand. Why do we believe the Bible to be the Word of God? Firstly, because of the testimony of Jesus Christ. In the Gospels we find Him constantly quoting the Old Testament scriptures as an authority. At the outset of His ministry in Luke chapter 4, we find Him quoting the book of Deuteronomy in effective answer to Satan’s temptations. Jesus began His ministry with the words, “It is written,” a straight assertion of the authority of Scripture. After His resurrection, in Luke chapter 24, we once more find Him expounding the Scriptures, first to two disciples walking to Emmaus, then shortly afterwards to the eleven in the upper room. And again and again throughout the three-and-a-half years that lay between these incidents we hear Him quote the Hebrew Scriptures as the authoritative Word of God. And remember, these Jewish Scriptures are the very same Old Testament that we have with us today. In the brief record of the four Gospels, Jesus made at least fifty-seven quotations from and allusions to the Old Testament. Since this was evidently His custom, there must surely have been countless more such instances which the New Testament does not record in detail. What is abundantly clear is that the Lord entertained no doubt at all about the authority of the Old Testament. It was, in fact, the only written authority that He accepted on earth. When answering the Pharisees and the Sadducees of His day, He always quoted Scripture.” It is written “was His ground of appeal. Whereas many of today’s preachers quote theologians, philosophers, psychologists – and even secular writers, the Lord Jesus never cared to quote the opinions of others. His only authority was the Old Testament. If we accept His testimony at all, it necessitates our accepting the Bible as God’s Word also. Those who reject the Bible reject the testimony of Jesus Himself. Secondly, we accept the Bible as God’s infallible Word because so large a number of detailed prophecies contained in it have been fulfilled. One-third of the Bible is prophecy. Prophecies concerning the birth, death and resurrection of the Lord Jesus were made in the Old Testament hundreds of years before He came to earth, and these were literally fulfilled when He came Prophecies concerning many of the leading nations of Old Testament times, and especially concerning Israel, have been fulfilled to the very letter. In our own life-time the Jews have returned to their homeland in Palestine and taken possession of the city of Jerusalem. Yet these events were foretold 2,500 years ago. Another proof of the Bible’s Divine inspiration is the remarkably unity that is found in its sixty-six books. They were written in three different languages over a period of 1,600 years by some forty different authors of varying standards of education and the widest range of social and cultural backgrounds – kings, shepherds, military leaders, seers, Pharisees and fishermen. Yet even so there is a marvelous unity throughout this whole library of writings, and not a single fundamental contradiction. Apparent contradictions here and there are of a trivial nature, to be explained by errors in copying of the text. Fundamental moral and ethical contradictions there are none. Many of the historical statements in the Bible have been questioned, but have been confirmed on further research. It scientific statements (though few, because it is not a text-book of science) are all true to the established facts of the physical world. Though written at a time when man’s scientific knowledge was extremely faulty, it contains none of the crude fallacies that were believed by men in those and even much later times. Science is constantly changing its views and rewriting its books, but the Bible needs no such revision. The fact that the Bible has stood through the centuries triumphant over every attack upon it by its foes is yet another proof of its Divine inspiration. There is no book in the world that has been attacked so vigorously as the Bible. Yet it has gloriously survived the criticism of its friends and the hostility of its enemies. The French infidel Voltaire once said that in a hundred years there would be no Bible. They were “famous last words” indeed, for ironically enough, after his death, the Bible Society opened its office in the very house in which he had lived! Thus has God vindicated His Word. Infidels may come and go, but the Bible goes on from strength to strength. No other book has been so loved and respected and treasured by men and women the world over. It remains the world’s best-seller. Then again, we believe that the Bible is God’s inspired Word because of the accepted fact that countless lives have been transformed by it, sometimes indeed by just one verse from its pages. Passages of Scripture which no one would imagine could have such an effect have been used by God to convert people and bring them to salvation. Wicked men and women have been transformed overnight into saints of God through the reading of some passage or other in this marvelous Book. This has happened even in vernacular versions where the translation has been so poor as to make such a result highly improbable. God does indeed speak through this Book to effect moral changes in human lives. A sixth proof of the inspiration of the Bible is its inexhaustibility. Through the centuries many brilliant men with the keenest intellects have spent their lifetimes studying it. Yet even so its depths have not been fathomed. Like a bottomless mine, the Book continues to yield new treasures, speaking to men in ever fresh ways. Moreover, its message has such a sublime simplicity that even a child can grasp it. Time cannot out-date it; it is time-less. If only we have the humility to consult it, we will find the answer to all our problems in this wonderful Book. That could never have been possible were it merely a human writing; but being divinely inspired it contains the inexhaustible wisdom of the infinite God. Man therefore can ever draw from it according to his need. Finally, the greatest proof of its inspiration is that, as we read it in humility before God, He speaks to us through it. Hearing its words we become growingly convinced that they are the voice of God. Scripture’s great themes, such as the doctrines of the Trinity and of the atonement, could never have been invented by men. They could only have been known through the Spirit’s inspiration. They are in a true sense God-given. We discover, too, an amazing design in the content and message of every book in the Bible, especially when it is viewed as a mirror reflecting the Lord Jesus Himself. The title of an old commentary, Christ in All the Scriptures, aptly describes what students of the Bible have constantly found, that the entire Scriptures “hang together” in wonderful detail to form an ever more convincing pattern when He is the goal of their study. while speaking about the last days. The Apostle Paul in 2 Thessalonians 2:3 also speaks of a ” a falling away ” prior to the day of the Lord. This defection is obviously due to Christians being lured away by some subtle deceit of Satan. These warnings are serious. If in spite of them we still remain unwatchful, we shall most certainly find ourselves deceived. How does a man seek to deceive you? If he wants to cheat you of one hundred rupees by passing a counterfeit currency note, he will ensure that the counterfeit note is as close as possible in appearance to the real thing. Only so will he hope to trick you. And Satan is no less subtle. His most powerful tool with which to deceive the unsuspecting Christian will be a “Christian” preacher – one who preaches with the Bible supposedly as his basis but who has not bowed his knee to its authority. Watch him! On closer inspection the things he preaches either are not found in the Bible at all, or they give a slanted and unbalanced presentation of Biblical truth. The safeguard against all such deception is the Bible itself. If we do not know our Bibles well, we shall surely fall a prey to such deception. Unless we make the Bible our final authority in all matters relating to our faith, we shall be tossed about hither and thither until that faith itself is lost. The Lord Jesus condemned the Pharisees and scribes for rejecting the Old Testament and replacing it with their own traditions (Mark 7:5-13). Their long-standing rejection of the written Word of God led finally to their rejection of the living Word when He came into their midst. The spiritual descendants of those scribes and Pharisees are found in our own generation. And many are being deceived by them. How watchful we need to be. We are told by the psalmist that God has magnified His Word above all His Name (Psalm 138:2). To reject or ignore it therefore, or to treat it lightly, is to invite immeasurable loss. But to reverence it is to discover a door into untold riches. The overwhelming necessity of spending time each day with God’s Word is implied clearly in the words of Jesus to Martha, with which we opened this chapter. There are many other things which may help us and which may prove useful, but this one thing above all others is absolutely essential. We can no more do without it than our physical bodies can do without oxygen. It is quite indispensable. The supreme essential for our spirits is indeed just this – to sit at the Lord’s feet daily to hear His Word. The Lord Jesus knew, better than anyone else, all the factors that affect a man’s life. He knew every possible situation that any man could ever find himself in. He knew the dangers that lay ahead of every man and He knew all the wiles of Satan. He knew what was necessary for man’s spiritual growth, for He alone knew the relative importance and unimportance of things. Knowing all this, He said that one thing was needful above all else. He used similar words in Luke 4:4. “Man shall not live by bread alone but by every word of God.” This is a quotation from Deuteronomy 8:3, where reference is made to the manna with which God fed the Israelites for 40 years in the wilderness. The Israelites were told there that God’s purpose in giving them the manna daily from heaven was that they might, in like manner, learn to receive God’s Word. If they were to be strengthened for their wilderness journey those Israelites needed the manna daily. Even so does man require to receive the Word of God daily, if he is to be empowered to face the trials of life. Jesus never made these statements lightly. He was seeking to impress upon His disciples the absolute necessity of hearing His Word daily. If that is true, then it follows that a life that is lived without time given to meditation on God’s written Word is a wasted life, no matter what else it may have achieved. In Luke 17:26-30, Jesus tells us that the last days will be like the days of Noah and of Lot, in which people ate, drank, bought, sold, planted, built, and so on. Have you noticed that none of these things are sinful in themselves? They are all legitimate activities. Why then did Jesus mention them as being peculiarly characteristic of those sinful days? Because the people of those days were so occupied with these legitimate activities as to have no time for God at all. The Devil succeeded in getting them to crowd God out of their lives altogether. This of course resulted, as it always will, in moral decay and corruption. Compare this state of affairs with what we see in the world today and we shall find an exact similarity of attitude and of consequent result. Men and women are too busy to have any time to listen to God. Look into your own life and see if this is not true. The spirit of the world has crept into the very heart of the believer. Even though science has invented many time-saving devices which our forefathers did not possess, yet man finds himself rushed for time. Today we can travel by car, train or aeroplane where they had to travel on animals or on their own two feet. Our ancestors had to spend much longer doing the daily household chores which today are done for us by gadgets and machines. Yet many of them found much more time for God than most people find today. Why? Because they had their priorities right. They put first things first. If we are to be effective witnesses for our Lord, it is imperative that we spend time each day at His feet listening to His voice. There are many today who are ambitious to preach, who have never developed this habit of listening to God’s voice daily. The result is a sad paucity of “the word of the Lord” and a sickening abundance of man’s words. Of how very few of today’s preachers can it be said that” the word of the Lord is with him” (2 Kings 3:12). Yet this was the distinguishing mark of every true servant of God in the Bible. No man has the right to speak to other men about God, who has not first spent time listening to what God Himself says and this refers to private witnessing as well as to public preaching. It is written of Moses that he went in before the Lord and then “came out and spake unto the children of Israel that which he was commanded” (Exod. 34:34). Joshua was told that his life would be a success only if he meditated on God’s Word daily (Josh. 1:8). Samuel is another classic example of one who patiently waited to hear God speak, and then spoke to the people. The result was that the Lord “allowed no single word of his to fall to the ground” (1 Sam. 3:19). Listening to the Lord does not mean merely reading the Bible. There are many who read their Bibles purely as a matter of routine. Listening to the Lord means more than that. It means meditating on His Word until we receive, through it, His message for us. Thus alone can our minds be renewed and conformed growingly to the mind of Christ. But many who read their Bibles have never yet learned thus to meditate. Psalm 46:10 tells us that we must be still if we are to know God. Sitting at a person’s feet is also a picture of humility. Mary was not sitting on a chair on the same level as Jesus, but on a lower level. God never speaks to a proud man, except in judgment. But He is ever ready to speak and to offer His grace to the humble soul who will be as a child before Him (Matt. 11:25). Thirdly, sitting as Mary did is a picture of subjection. It is the attitude of a disciple in the presence of his Master. Our subjection is manifested in obedience to God’s Word. God has not spoken in his Word to satisfy our curiosity or to give us information. His Word is an expression of His heart’s desire. He speaks in order that we may obey. Jesus made it clear in John 7:17 that it is only if we are willing to do God’s will that we shall receive an understanding of that will. Many Christians go through months and years of reading the Bible without seeking to hear God speaking to them through it. Still they seem to be quite satisfied. I ask you, Do you hear the Lord’s voice each day? If not, what is the cause? He speaks to those who listen. What is it that is stopping your spirit’s ears? Is it lack of stillness before Him, lack of humility of spirit, or lack of obedience to what He has already said to you? Or is it perhaps a lack of desire itself? Whatever it be, God grant that it may be remedied at once and permanently. Pray Samuel’s prayer, “Speak Lord, for thy servant heareth.” Then open your Bible and seek the face of the Lord earnestly, and you too shall hear His voice. We shall never fully appreciate the importance of sitting at the Lord’s feet daily to listen to His Word, until we understand the effect that it will have upon our lives. A man who is given a medicine by a doctor, but who is skeptical or unsure of what that medicine will do for him, may not, as a result, care to take it regularly. He is not likely to feel that he has lost anything when he neglects to take it. But if, on the other hand, that man is made to understand what a marvelous cure the medicine will work in his body and the tremendous improvement that it will bring to his health, then whatever it costs him to take it regularly, it is very unlikely that he will forget to do so. In very much the same way, we find thousands of Christians who never have a regular devotional time with God and His Word, yet who still do not feel that they have missed anything. Search your own life. If you miss a quiet time with God one day, do you feel a sense of regret at having lost something valuable, or do you feel that you have not lost much? How does it come about that so many children of God never have a quiet time with God daily and yet remain so complacent about it? It can only be because they have not fully appreciated the creative effect that God’s Word has upon a person’s life. For as we shall see, it is more than a medicine; it is food. They have not realized how much they are losing by not subjecting themselves to its transforming power. In order to understanding something of the effect that the Word of God has upon a man, we shall consider nine Biblical symbols by which it describes itself or is described. First of all, we shall look at Psalm 119:105, where the Word is likened to light. “Thy Word is a lamp unto my feet and a light unto my path.” When we walk through unknown terrain in the dark, we use a light in order to see our way. That is a picture of what the Bible does for us in a world that lies in the pitch darkness of sin. It shows us the path to God. We can know nothing of God’s way of salvation apart from the Bible. Further, the Bible gives light to the Christian on the pathway of right doctrine, showing up at the same time the pitfalls of false teaching alongside the road, so that he may not fall into them. Without that light, he would never know what was false and what was true. The Holy Spirit commended the believers at Berea, because they did not receive even what the apostle Paul preached in them until they had themselves checked it with the Scriptures (Acts 17:11). Only then did they accept his message. (Was it because of this attitude to the preachers who came to them that Paul had no need to send an epistle to the Bereans correcting false doctrine, as he did to so many of the other churches?) People who search the Scriptures diligently are not easily lured into false doctrine. They know the truth that has made them free. Unfortunately, many thousands of Christians today are either too lazy or too pre-occupied to study the Bible for themselves. Their resultant ignorance of the Scriptures makes them an easy prey for the Devil’s deceptions. Alas, such things as eloquence, emotionalism and logical presentation of the message are in our day the criteria by which a preacher is judged. 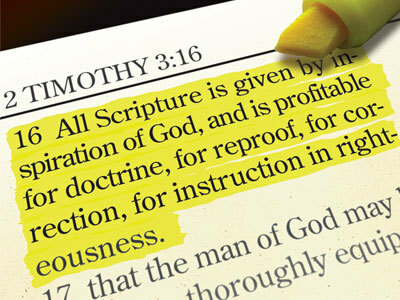 Whether he expounds the Word of God correctly or not seems to be only of secondary importance. Remember that true doctrine matters infinitely more than a man’s personality or gift of speaking. The contents of a medicine bottle are more important than its size or shape or appearance! Do you look for the truth or for eloquent messages? And if it is indeed the truth you look for, how can you know what the truth is, unless you know the Bible first? There is a story of a man who was told by his priest that the Bible could not be understood by laymen like him, but who happened to get hold of a New Testament and was saved as a result of reading it. One day while the book was open in front of him, the priest dropped in to visit him and asked what he was reading. On his replying that it was the Bible, the priest protested that he should not read it as it was not meant for uninstructed laymen. uncorrupted doctrine. For in this sin-darkened earth, the Word of God is the only light that we have, to walk by. It is also therefore the key to the problem of guidance. God has marked out a pathway for our lives, but many Christians complain that they are unable to find it. Often the reason is simply that they have not spent time regularly in meditation on God’s Word. “Thy word…is a light unto my path.” It is God’s provision to show us the road. Secondly, the Word of God is likened in James 1:22, 23 to a mirror. We need a mirror to see whether our faces are dirty or clean and whether our hair is disorderly or combed. Without one, we cannot tell how we look. If James had been writing his epistle in the twentieth century, he might perhaps have gone a step further and used a more modern symbol – the X-ray – to illustrate this effect of God’s Word. An X-ray film shows me the conditions of the interior organs in my body, which I cannot know otherwise. The Bible does something similar in that it shows me the condition of my heart before God. It corrects me and reproves me so that I might be perfect and fully equipped to serve Him (2 Tim. 3:16, 17). Many people today are deceiving themselves about their spiritual condition, thinking that there is nothing wrong with them. Why? Because they have never subjected themselves to the X-ray of God’s Word. It is possible that, even as believers, we may be unaware of sins of which we are guilty before God. I have often found during times of meditation on the Scriptures that the Holy Spirit has made me aware of some sin – some selfishness of motive, perhaps, in my actions – of which I was totally unaware until He made it known. We need to subject ourselves to a daily examination through the mirror (or X-ray) of God’s Word if we are to avoid spiritual stagnation and decay. Not a day goes by in our lives without our examining our faces in a mirror. May not a day go by either without our examining our hearts. Then, in Jeremiah 23:29, the Word of God is likened to a fire. Fire, in the Bible, is used as a symbol of that which purifies or burns up. Gold put into the fire is purified, whereas wood is consumed. The Word of God, similarly, has a purifying effect upon our lives, eliminating from them what is un-Christlike. It not only shows us our faults, as we saw above, but it also makes us holy. No man can ever hope to be holy without spending time every day at the Lord’s feet, for that alone can purge away all the dross from his life. But it is also terribly true the same fire will burn up the one who rejects the Word (John 12:48). Our attitude towards God’s Word determines whether it will purify or destroy. If we submit to it, it will purify us. If we ignore or spurn it, then it will surely consume us. In the same verse of Jeremiah 23 we see, fourthly, the Word of God likened to a hammer – a hammer that breaks the rock into pieces. If you want to make a road on a mountainside, you have to break up rocks. In these days we use dynamite for that purpose, whereas in Jeremiah’s day they used hammers. The Word of God is His dynamite, capable of removing huge obstacles out of our way. We all face trials and problems in our lives -situations in which the mountains have closed in upon us and it appears as Often we have remained in such situations, discouraged and defeated, not knowing what to do or where in turn. Our ignorance at such times of the promises that God has given us in Scripture has prevented us from claiming them. Otherwise, like dynamite, they would have blasted away the obstacles in our path and taken us triumphantly through the mountain barrier to the other side. How much we have missed by not knowing the Word! Fifthly, in Luke 8:11, we find the Word of God likened to seed which, when sown into the ground, produces fruit. 1 Peter 1:23 states that our new birth itself is a result of that seed sprouting in our hearts. Only as we are fruitful can God be glorified through our lives. Is there, in your life and service, fruit for the glory of God? Is it manifest, in your own life first of all, in terms of love, joy, peace, patience, kindness, goodness, faithfulness, gentleness (meekness), and self-control? (Gal. 5:22, 23). And then, do you find fruit in your service, in the shape of sinners turning to the Lord and believers being drawn closer to Him? If not, perhaps the reason is that you are not regularly receiving the Word of God into your own heart as seed “having life in itself.” Psalm 1:2, 3 tells us that it is the man who regularly meditates on God’s Word, who alone will be like the fruitful tree, prospering in all that he does. The Word of God is also likened to food in Psalm 119:103. The same symbol occurs again in Jeremiah 15:16 and in 1 Peter 2:2. The prophet Ezekiel and the apostle John are each shown too in Scripture as” eating” a book (Ezek. 3:1-3; Rev. 10:9, 10). We have here a picture of men assimilating and digesting the Word of God. Food gives us strength. Our bodies cannot be built up without it. A person who is under-nourished will be skinny and weak in his constitution, and therefore unable to resist disease. He will also be unable to defend himself if physically assaulted by another. A small push will often be enough to knock him down. In exactly the same way, one who neglects the Word of God will be spiritually under-developed, and consequently unable to resist temptation and to withstand the Devil’s onslaughts. Only those who regularly meditate on God’s Word grow into strong virile Christians (1 John 2:14). Mere reading of the Bible will not make you strong, but meditation upon it allows the Word to penetrate into the very core of your being and thus to become a part of you, hidden in your heart (Psa.119:11). Job said that he esteemed the words of God’s mouth more even than his necessary daily food (Job 23:12). By listening to God daily he built up a tremendous reserve of spiritual strength. This, no doubt, accounts for the man’s remarkable resilience in the face of Satan’s fierce assaults. He did not lose his faith in God, in spite of all the adversity he faced. His wife, who obviously did not have the same regard for God’s Word as her husband, was ready to curse God as soon as calamity struck. Not so Job. His example gives us an idea of the tremendous strength that God’s Word, if received daily, can give us to face every trial in life. Seventhly, in Deuteronomy 32:2, the Word of God is likened to dew. Dew, in the Bible, is a figure of God’s blessing. When God blessed Israel, He gave them the dew and the rain. When Israel sinned God withheld them, as He did in 1 Kings 17:1. This symbol teaches therefore that God’s blessing comes through His Word upon all who receive and obey it. Proverbs 10:22 declares that that blessing can enrich us, making up for all our shortcomings. What an encouragement that is! More than one instance in the gospels serves to illustrate this. One day the disciples of Jesus were confronted with the task of feeding over 5000 people and all the food they could amass was five loaves and two fishes, the gift of a boy. They protested that it was totally insufficient, as indeed it was. But then the Lord blessed that food. As a result, all the people were satisfied and a large amount remained over. On another occasion we find the disciples toiled all night at fishing, and caught nothing. Then in the morning they heard Jesus speaking to them. They obeyed His instructions, and within a few moments the net was full of fishes. These are two illustrations of the fact that the blessing of the Lord does indeed make rich. The blessing that comes to us through His Word makes up for all our lack. You may be lacking in talents and unable to preach or sing or pray like others, but when the dew of heaven falls on your life, notwithstanding all your natural limitations, God can still make you a channel of blessing to thousands. So, wait upon the Lord daily with His Word in front of you. Do nor rush away from His presence until His dew falls upon your soul. But dew is more than blessing. It is also a symbol of freshness. Here is another thing that the Bible gives us, namely, renewal. Listening to the voice of the Lord day by day keeps our Christian life continually fresh. It saves us from becoming stale, with all that that implies of corruption and decay. Moldy bread will not make anyone’s mouth water. Even so, the staleness displayed by many believers cannot be expected to draw anyone to Christ. Is your Christian life fresh every day? It can be so only if you feed daily upon the heavenly manna from beneath the dewfall (Exod. 16:13-15; compare verse 20). The Word of God is further likened to wealth in Psalm 119:162 – or to gold, as in other passages of Scripture. Money cannot make you truly wealthy. You may acquire qualifications which give you great earning power and thus may reach a position where you can earn plenty of money; but that will give you only a wealth which passes away. Nothing but the Word of God can make you really wealthy.though we A truly wealthy man lacks nothing. He has enough and to spare. A poor man on the other hand, has to go around begging from those more fortunate than himself. The Word of God can make you so wealthy that you will never be at a loss. It will not only give you enough for your own needs, but will enable you to meet the needs of others too. There is not a single situation that you can ever face in life for which the solution is not found somewhere in the Bible. The answer will always be there in the experience of some Biblical character that parallels your own, or in some teaching of Scripture. If you know your Bible, you will find in the time of crisis that the Holy Spirit brings to your remembrance the appropriate passage and from it gives you His answer. I have found this to be true in more than one instance in my own life. When the Lord called me for His service on the 6th of May 1964, and I sent in my application requesting that I be permitted to resign my commission in the Indian Navy, the Naval Headquarters soon replied that they would not release me. I was really puzzled then, not knowing what to do next. The Lord then reminded me of the time when Moses had gone to Pharaoh and asked for the release of the Israelites that they might serve the Lord. Pharaoh rejected that request outright, but Moses did not give up. He kept going back to Pharaoh until the Israelites were released. There I had the answer to my problem! So I applied again for permission to resign, and my application was turned down again. I applied a third time, stating exactly the same reasons as before. For many months there was no reply. Finally I was released two years after I had first applied! This is an example of how God can make us wealthy enough to cope with every situation – and not only in our own life, but in the lives of others too who may come to us for help in their hour of need. Finally, turning to Ephesians 6:17 we find the Word of God is there called the sword of the Spirit. The Christian life is a constant battle with a cunning foe, whose method of attack is often to cast doubt upon God’s love, God’s justice, even God Himself. This sword can defeat his every move, provided we know how to use it. Discouragement is one of the Devil’s strongest weapons. With it he has knocked down many mighty men. Moses, Elijah and Jonah each trembled at its shock, but each one of these men overcame his own depression by listening to the Word of the Lord. You and I may be able temporarily to tide over our discouragement by occupying ourselves in some way that provides a diversion, but only by the Word of God itself can we ever overcome it completely. Jesus Himself overcame Satan in the wilderness solely through His use of this Sword. I remember a time when I was in the Navy, and our ship had been for more than a month based at a small port. We had been going out to sea daily for exercises. The pressure of work on board was intense, and this coupled with the fact that for a considerable length of time I had no opportunity for Christian fellowship, brought me one day into a very depressed state of mind. The situation had got on top of me. As I was sitting alone in my cabin, suddenly this verse flashed into my mind: “The Lord shall make thee the head and not the tail; and thou shalt be above only and thou shalt not be beneath” (Deut. 28:13). At once I saw that the Lord had promised to keep me ” on top ” in every situation. Immediately the joy of heaven came surging back into my heart and there was a song on my lips again. Such is the power of the Word of God to overcome every attack of the enemy. The nine symbols that we have considered above give us a little idea of the effect that the Word of God can have upon a man. I wonder whether you have now begun to understand why Jesus said that this one thing was the greatest essential in a believer’s life. Will you take His statement seriously? If so, then settle it right now that, no matter how necessary and even essential other things may appear to be, henceforth nothing shall be allowed to rob you of your daily quiet time with the Lord and with His Word. The Bible tells us of days that will come upon this world, in which there will be a famine of the Word of God (Amos 8:11, 12). There may be many counterfeits in that day – as we have seen, 1 Timothy 4:1, 2 suggests this -but a famine of the true. Those days, I believe, are almost upon us, and the famine of the true Word of God will only increase as the time goes by. Joseph in Egypt laid up corn during the years of plenty, so that when the famine came which God had predicted, there was no lack. If we are wise, we shall store up the Word of God in our hearts today against just such a need. May the Lord imprint this message deeply upon the hearts of us all. “Sitting at the feet of Jesus, O what words I hear Him say! Happy place! So near, so precious! May it find me there each day. Sitting at the feet of Jesus, There I love to weep and pray, While I from His fullness gather, Grace and comfort every day. ”have reached a dead-end. who is unselfishly seeking to serve the Lord and others. Yet despite her zeal she was rebuked by Jesus. What, we ask ourselves, is the point of this? What was wrong with her action? And the answer, surely, lies in those four words of Jesus: “One thing is needful.” Martha was not rebuked for her service, but for not putting first things first.